Situated in Solana Beach, this cabin is within 3 mi (5 km) of Belly Up, Del Mar Racetrack, and Del Mar Fairgrounds. Del Mar Beach is 2.7 mi (4.3 km) away. 5 tips for a fun family weekend at LEGOLAND. Opens in a new window. This Holiday os exactly in between Legoland and SeaWorld which made it easy to travel to both theme parks and come back and relax. It is also walking distance from various restaurants and it offers a great breakfast buffet. Paul at registration was great and very helpful and friendly, we will definitely recommend to others with family. I like the location of the property, which is within walking distance to the beach. Where to find Solana Beach hotels near an airport? 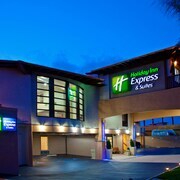 Where can I find hotels in Solana Beach that are near tourist attractions? If you are trying to decide where to base yourself in or around Solana Beach, you'll find a wide assortment of options. 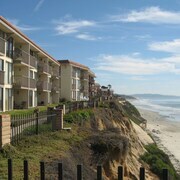 Expedia lists 34 accommodation options within a 0.1-kilometre (0.06-mile) distance of Solana Beach's center. 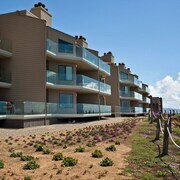 Accommodations that are in strolling distance of the Solana Beach city center, are the Cardiff by the Sea Lodge and Winners Circle Resort. 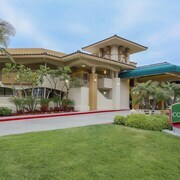 The Holiday Inn Express Solana Beach-Del Mar is one of a limited number of more economical places to stay in Solana Beach. The Rancho Valencia Resort and Spa is 7 kilometres (4 miles) from the heart of Solana Beach. Or, alternatively, the Fairmont Grand Del Mar is situated 8 kilometres (5 miles) away. Other Expedia-listed accommodations are the Pantai Inn and the L'Auberge Del Mar - Destination Hotels & Resorts. 40 kilometres (24 miles) to the south of Solana Beach you'll find Coronado, where you can spend a few hours exploring Centennial Park and Coronado Ferry Landing. 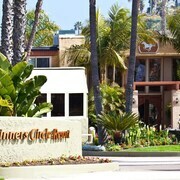 The Hotel del Coronado and Coronado Island Marriott Resort & Spa are just some of the hotel alternatives in Coronado. 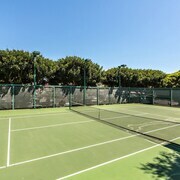 Alternatively, you could consider staying at Beach Cities, 25 kilometres (16 miles) to the south of Solana Beach, where you can choose from the Tower23 Hotel and Pacific Terrace Hotel. The Golf Gardens Miniature Golf and Giant Dipper Roller Coaster are a couple of the most popular attractions to explore for those visiting Beach Cities. If you like sports and love watching local games you might decide to take a trip to Petco Park, which is 35 kilometres (21 miles) to the south of Solana Beach. Those sports fans wanting to sleep close by can choose from the Hard Rock Hotel San Diego or the San Diego Marriott Gaslamp Quarter. For travelers planning on flying via McClellan-Palomar Airport, you may choose to book a bed at Four Seasons Residence Club Aviara, North San Diego, or Park Hyatt Aviara Resort, Spa & Golf Club, which are both a short drive away. 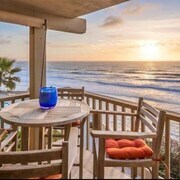 What are the most popular Solana Beach hotels? Are there hotels in other cities near Solana Beach? 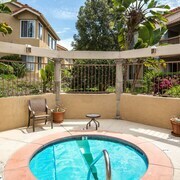 What other types of accommodations are available in Solana Beach? Explore Solana Beach with Expedia.ca’s Travel Guides to find the best flights, cars, holiday packages and more!